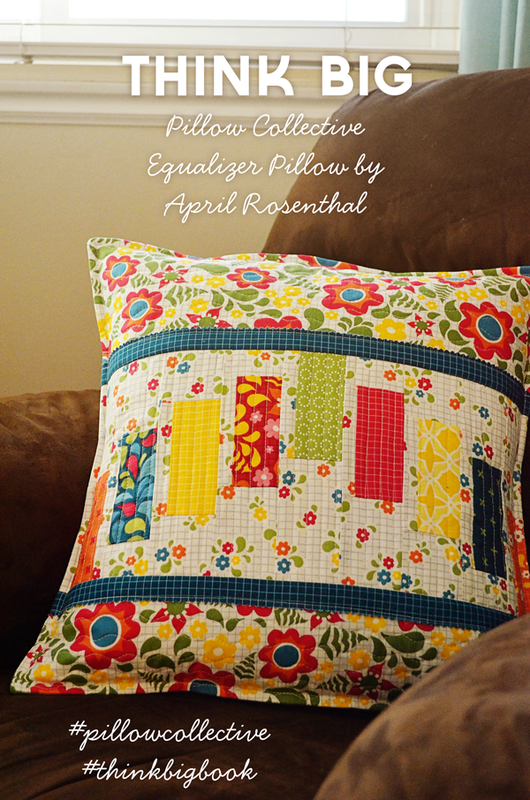 I’m posting this morning about a fun pillow I made for Amy’s Pillow Collective blog tour! This time around, Amy wanted to feature pillows made from blocks from her new book, Think Big! 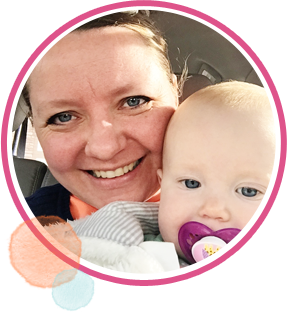 Since she started working on the book, I’ve been lucky enough to have a behind the scenes ride. As we’ve worked on other projects together, like QuiltCast, I was able to see her quilt, pillows, and table runners for the book as she made them. Her original Equalizer block was one of my favorites right from the beginning. Amy worked really hard on this book, and boy did she do a great job. The best part of the book, in my opinion, is how incredibly versatile it is. Every single block has diagrams to use it as a pillow, table runner, and several sizes of quilts. So truly, this book can see you through MANY, MANY projects, and still have more to give! I decided to mix it up a little, and instead of using a solid for the background, I used my Playing Field print behind the colored bars, and then my First Date print on the top and bottom. To break up all that busy colored goodness, I threw in some Graph Paper from the stream color way, and left the pinked edge raw for a little fun. The block went together easy and quick, and I’ve got to say, I think I agree with the kids. The rest of my pillows sure look “old” in comparison. PS Pat Sloan and Amy Smart also posted about their pillows today…go check them out! The full list of participants is here, with a few people posting each day through the 27th. Hi Patricia! Did you try the code without the quote marks? I love this pattern. Looks like things are just floating through it. And of course the fabric is PERFECT. Good, beautiful job. She did a good job with the block pattern, didn’t she? Thanks for stopping by and commenting! Mwa! I love that your kids are great cheerleaders for you. is known as a great concept..this may make your marriage ceremony memorable.